The Belgian post office has issued a beautiful set of stamps on the subject of "a literary walk through Brussels" with pictures of famous 19th century writers who stayed in the city. The writers are Victor Hugo, Charles Baudelaire, Paul Verlaine, Arthur Rimbaud, the Dutch writer Eduard Douwes Dekker and - Charlotte and Emily Brontë! The Brontës stayed in Brussels in 1842-3, while the writers on the other stamps visited the city in the 1850s-1870s. Charlotte Brontë was the only one of these writers who drew significantly on her Brussels experience in her writings. Shocking though the Brontës' works may have been to some Victorian readers, Charlotte and Emily are in incongruous company in this set of stamps. Their convent-like life in a girls' boarding school in Brussels could not have been more different from the colourful and often squalid existence of the French writers who accompany them! The Republican Victor Hugo came to Brussels as a political refugee, fleeing Paris for Brussels after Napoleon III's coup d'état, and stayed in Grand Place with his family – his mistress accompanied them and also lodged in Grand Place. Baudelaire, whose volume of poetry Les Fleurs du Mal had caused a scandal, came to Brussels to escape from his creditors. His plans of making money by giving lectures in Belgium came to nothing. He is remembered for eccentricities such as keeping a pet bat in his room and feeding it on bread and milk. Verlaine and Rimbaud were reunited in Brussels in 1873 after one of the many rifts in their stormy relationship but were soon quarrelling again. Verlaine bought a revolver and shot Rimbaud, wounding him slightly, and Rimbaud reported him to the police. Although he later withdrew the charge of attempted murder, Verlaine was sentenced and spent two years in prison in Belgium. This very attractive set of stamps was designed by Jan De Maesschalck and costs €5.90. Visit the Brussels Brontë Group by clicking HERE. Readers of the Brontë Parsonage Blog may be interested in a recent report by Sue Corbett in The Times on the two hundredth anniversary of the birth of Elizabeth Gaskell which mentions our talk in Brussels. It is time to move on from those corpse-strewn specials of Elizabeth Gaskell’s Cranford shown on television at Christmas. For fans of the increasingly popular Victorian novelist, the mood of 2010 is distinctly cheerier, this being the year they celebrate their heroine’s bicentenary. The author of Cranford, North and South and Wives and Daughters (all of them titles enthusiastically dramatised by the BBC in recent years), Mrs Gaskell was born in London on September 29, 1810, and on September 25 this year she will be honoured in the city of her birth when her name is added to a stained-glass memorial window in Poets’ Corner. For much of the rest of the year, however, the focus of commemoration will be on her adopted home city of Manchester (or “Drumble” as she calls it in Cranford). An exhibition of new work by Yorkshire-based artist Jo Brown will open at the Parsonage on Friday 5 March 2010. The exhibition, The Sunbeam and the Storm, will take place as part of the museum’s contemporary arts programme and will feature eight new abstract paintings by Jo Brown in direct response to the poems of Emily Brontë. 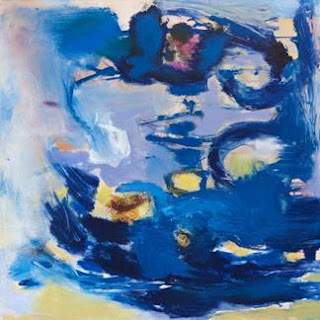 Jo Brown’s paintings are abstract and intuitive, and for this exhibition she has used colour, layers and mark-making to create a personal response to Emily's poetry - in particular focusing on Emily’s use of weather to express emotion. All of the titles in the exhibition are small quotations taken from the poems. Jo's inspiration has often been partly drawn from poetry. She discovered the poems of Emily Brontë relatively recently after attending an arts event in Haworth, and her imagination was caught. The poems seemed to Jo heartfelt and moving, and an insight into the mind of the solitary Emily. All of the paintings in the exhibition are for sale. The exhibition runs until Tuesday 4 May 2010. Jo Brown was born in Tunbridge Wells, Kent, and studied in Yorkshire, at Bretton Hall College then Sheffield Hallam University, gaining a BA (Hons) in Fine Art in 1995. She has been a studio artist at Dean Clough, Halifax since 1995 and has exhibited regularly at municipal and commercial galleries in England, Scotland and the USA. As well as the Brontë Parsonage Museum, Jo has upcoming exhibitions at Cupola Contemporary Art Gallery, Sheffield; Gossipgate Gallery, Alston, Cumbria; 20-21 Visual Arts Centre, Scunthorpe, Lincolnshire and a solo show at Whitfield Fine Art, Mayfair, London (September 2010). Live in BD20, 21 or 22? The Brontë Parsonage Museum has recently completed a project with support from the Heritage Lottery Fund to improve the presentation of the historic rooms of the Parsonage. To celebrate, admission to the museum will be free to local residents of BD20, 21 & 22 on Saturday 20 February . Locals are asked to bring a utility bill or other official proof of address to gain admission. The museum is reopening following a major programme of work to improve its displays, which include a number of rare and important new acquisitions and items never previously displayed. Amongst these are items as diverse as Emily Brontë’s artist box, purchased at Sothebys in December, and a pair of Charlotte Brontë’s stockings. The museum is keen for local people to come along and see the changes made, since many contributed ideas to the development project through a visitor survey and a series of open evenings last year. The museum is open 11.00am to 5.00pm (last admission is 4.30pm). We hope that people in and around Haworth will come and see the work that’s been done, which we feel has greatly improved the museum. There are some wonderful items on display this year, including things donated by local people, and these give an insight not only into the lives of the Brontës, but also life generally in nineteenth-century Haworth. Would you be interested in finding out more about the Brontë Parsonage Museum and its remarkable collection? … discovering what goes on behind the scenes at the museum? … learning new skills and meeting writers, artists and visitors to Haworth and the museum from around the world? The Brontë Parsonage Museum will be launching a volunteer programme shortly and is looking for volunteers to work as Museum stewards at the Parsonage. Those with some free time are being invited to put themselves forward as volunteer stewards, to work hours during the day, between Monday and Friday. Full training will be given. As well as offering enjoyable, interesting and useful experience, volunteers will also receive various benefits including free admission to Brontë Society events. This initiative is part of a Heritage Lottery funded project which has involved various improvements being made to the historic rooms of the Parsonage, but also a range of activity to try and involve local people in the work of the museum. The Parsonage is a fascinating place to work and volunteer stewards will have the chance to find out at close quarters, more about their local heritage and about the museum’s collection, which is constantly developing. Working directly with visitors to the museum and the chance to meet visiting authors and artists will I’m sure make this a very rewarding opportunity. 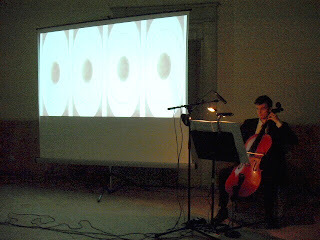 2009 saw HLF celebrate its 15th anniversary. Using money raised through the National Lottery, the Heritage Lottery Fund (HLF) sustains and transforms a wide range of heritage for present and future generations to take part in, learn from and enjoy. From museums, parks and historic places to archaeology, natural environment and cultural traditions, we invest in every part of our diverse heritage. HLF has supported 33,900 projects, allocating £4.4billion across the UK, including £341million to projects in Yorkshire and the Humber alone. On 7th February an interesting meeting in English about Parmenides was held in Ascea-Velia, Italy, just the place where this ancient Greek philosopher was born and from which Eleatic School thought spread. The event was organized by Parmenideum (www. Parmenideum.com), an association whose purpose is the increasing of knowledge of the Eleatic School of Philosophy and, not least, of all its contemporary ramifications in intellectual life, science, and culture. A SHORT NOTE linking an aspect of Parmenides thought to Emily Brontë’s poetic. As a long time scholar of Emily Brontë, the famous English author who lived in the mid-nineteenth century, I found in one of her poems a useful hint to today’s discussion about Parmenides Being/Not Being principle. I refer to the last two stanzas in the famous poem No coward soul is mine, probably written in 1845 and seemingly one of the last in her production but surely Emily Brontë’s crowning poetic peak and the consummation of her thought. ei ge genoit, ouk est', oud ei pote mellei esesthai. tos, genesis men apesbestai kai apiotos olethros. Surely Emily Brontë never heard of Parmenides in her remote Yorkshire village but her deism in this poem is conveyed towards an entity whose existence is the Being versus all the rest that is in any case a Not Being and we understand this in her last verse in particular ‘What thou art may never be destroyed’ where the author’s convinction is asserted as an absolute truth just following Parmenides path. 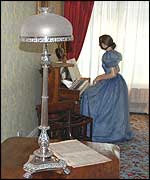 In the pictures - Red House and 'Mary Taylor' at the piano. A interesting exhibition - Mary Taylor - An Independent Yorkshire Woman - is on now at the Red House Museum in Gomersal and not to be missed. It finishes on 18 April. Mary Taylor was Charlotte Brontë's schoolfriend, and an inspiration. Charlotte visited and stayed at Red House, the family home of the Taylors and depicted the family in her novel Shirley.There are various items in the exhibition relating to Charlotte. Mary Taylor was a woman who lived a unusually independent and adventurous life for a woman of her time, and was a pioneering feminist in the nineteenth century. She taught boys English in Germany, emigrated to New Zealand and started a business, then, after making a good living, returned to Gomersal. She was the leader on mountaineering expeditions for women in Europe, and wrote magazine articles and a novel Miss Miles : A Tale of Yorkshire Life Sixty Years Ago. The exhibition gives the visitor a real insight into Yorkshire history, and gave us some new facts we did not know about. Well done to the Curator and staff at Red House for an informative and interesting exhibition. And well done to the Parsonage Museum for sucessfully acquiring items at the two recent auctions. We are looking forward to viewing them. To read about Mary Taylor in Wellington, New Zealand, click THE CUBA STREET MEMORIES PROJECT.